Graham's month long birthday celebration really got me thinking. Birthdays only come around once a year (duh) so they should be fabulous! They should be month long celebrations! And who says you have to be a kid to get excited about your birthday?? October 1st will begin my birthday celebration!! I'm not trying to be selfish but my birthday just always seems to get in the way. It's on Halloween and there is always so much going on during the days surrounding Halloween that my big day always seems to be an "oh yeah, we better celebrate your birthday really quick before we go trick or treating" kind of thing. Poor me...sniff, sniff. I know, I'm a big baby. Over the last few years I've kind of gotten used to it but this year, I'm changing it up. I'm enjoying my birthday! I've been blessed over the past thirty something years and I'm going to celebrate! I was thinking about this in the pick up line at school the other day and while Charlie snoozed I made a list of things I wanted to do during the month of October. I love lists! Here's my checklist...I'll keep you updated on my progress! 2. Go to a movie...not a kid's movie. 5. Commit a few random acts of kindness...anonymously. 6. Take my kids to get those super cute donuts at our favorite donut shoppe. 7. Have lunch at school with my kids. 8. Try a new recipe. 10. Take one full day off...No working...AT ALL. 11. Go to the pumpkin patch. 12. Buy a great new pair of shoes. 13. Take a really long nap with no interruptions. 14. Sleep in with no interruptions. 15. Cut down on my Diet Dr. Pepper. This btw does not sound like fun and does not seem in the list little bit like a good way to celebrate my birthday BUT it would probably be good for me considering my massive consumption. I'll consider it a little gift to my health. 16. Buy a fabulous new pair of earrings. 17. Go out on a date with The Baker. 18. Go out with a girlfriend for breakfast, lunch, dinner, drinks, whatever. 20. Finish reading "The Shack." It came highly recommended but I just can't seem to get through it. 21. Buy, or better yet, GET fresh flowers. 22. Organize my kids' rooms. Seriously, this sounds like fun to me. I love it when I actually can find the time to do this. Sort, purge, clean! love it! 23. Stop drooling and get this new bedding. This list is getting expensive...it might have to turn into a 2-3 month long bday celebration. 24. Eat at a new restaurant. 25. Get my hair colored. I don't ever do this but I'm finding gray hairs lately...so sad. Aren't I too young for gray? 27. Get started on my Christmas shopping. 29. Make a sparkly glittery craft with Nora. 30. Finally finish at least one of the kid's photo albums that I have already started. 31. Back up my computer and breathe a sigh of relief. 32. Go HERE and eat something yummy! This might be kind of hard considering there are no locations anywhere near me but a girl can dream, right? 33. Get my MomAgenda refill and get organized. 34. Pick out the perfect chandelier to hang over our bed and start saving for it. 35. Go to Queenie's and have a breakfast scrambler and hope that I show up on the bacon, tomato, asparagus day. That's it....the 35 things that I will try to do during my month long birthday celebration. I'm excited...I'm getting started tomorrow! Maybe I'll just get started right now. Happy Birthday Month to me! I'm back!! I'm finally feeling caught up and I'm ready to start taking new orders. I mentioned way back when that I was thinking about creating a lollipop kit and here it is! SO CUTE! It's the perfect party favor!! I will be carrying these while supplies last so order NOW! Choose any design! 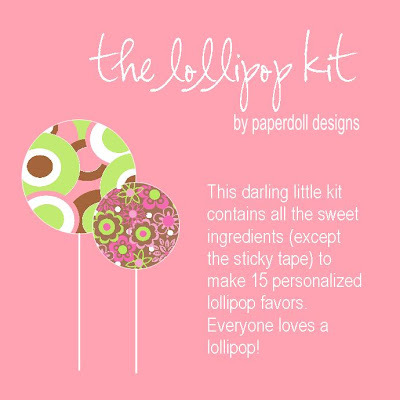 Each kit contains 15 lollipops, 15 personalized circle tags and 15 precut ribbons. I'll assemble one lollipop favor and then all you need is the tape! I'll be busy watching Grey's Anatomy. I mean, catching up on orders. I have to dedicate all my free time to Dancing With the Stars. My DVR is set and I'm all about Lacey & Lance. I'm not usually a big follower of this show but I loved Lacey on So You Think You Can Dance a few seasons ago. I was so excited when I found out she was going to be on this show!!! Did you see it last night?? FABULOUS! I'll be taking orders again when Lacey & Lance get kicked off the show. I'm kidding...I think. I will not be able to accept anymore orders! I've never had to do this and I hate to do it but I just can't take anymore orders until I catch up a little bit. I'm so happy to be so busy but I just don't want to start making people mad because I'm being so slow SO I'm going to have to put a hold on any new orders. If you sent an oder in today I will gladly accept it but please allow about 2 weeks for it to be complete (unless other arrangements were made.) If you have an order please hold off until further notice. It may only be a day or two...who knows. I'll be back soon! I've been a bad, bad blogger. I really do have lots to blog about...I just don't have the time to blog it. Here's quite possibly the longest picture post ever and hopefully I will get back into the blogging routine very soon. cute cute cute! love the way this one turned out!! "i need a name" tray - sweetheart LOVE LOVE LOVE this one! big dotty blue & blue calling cards - jackson jr.
hepburn pink placemat & sippy cup - such a cute idea for big sis/lil sis gifts! candy rolls - great shower favors! tatoo baby placemat - so cute!